Available NOW - My LATEST BEST SELLER! Click on titles to see books. Available in Paperback and Kindle. And click on My Photo for all my latest news. As an entrepreneur I've learned a lot about successful living and how to make the most of whatever life throws at me. So as a business consultant, life coach and writer my mission is to inform, inspire and ignite you to take action; to seize control of your own life by leveraging your own skills, talents and abilities in the same way as I have done. Learning and earning should be fun, so my books are both humourous and enlightening. Texts are based on my own real life experiences and expressed in simple, easy language. I'm told that they are a joy to read and very often life changing too! Judge for yourself. Why can one person create vast wealth with apparent ease, whilst another flounders in permanent poverty? Is there a secret to success known only to a few? I assert that there is no short cut to riches but that there is an art to making money based on the manner in which you conduct your life; and by altering the way you think of success and by following my simple strategies you may well come to master it! 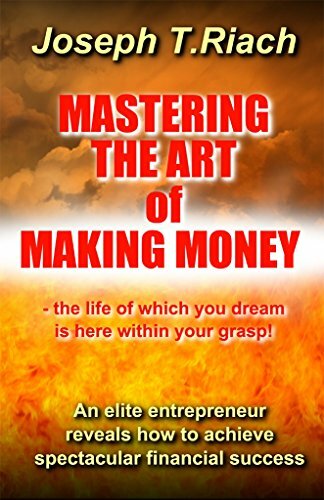 With a mix of real life experiences, fun stories, professional insights and a powerful punch, I disclose in exact detail how to fulfill your dreams of wealth and prosperity. This book is my blueprint to spectacular financial success. The life of which you dream is here within your grasp! Click to see Amazon page. "This book gives a gloriously original view of personal development, what it is and what it means. It is seriously well written, addresses the topic with real authority, is often very funny and is inspirational too! There is no other book on the subject comes close to matching the author's unique mix of gravitas and humour. Joseph T.Riach (Tom) has brought his lifetime of experience in assisting people in their lives and businesses to life in vivid fashion in a rich blending of his personal views, experiences, anecdotes and conclusions. He expresses with authority and clarity his belief that bettering yourself should be an enjoyable endeavour and helps you to identify why and how personal development will work for you. His motto is to live life, laugh and love! - and become a better person as a result." - literary review. Click to see Amazon page. Can you sell anything to anyone just by being yourself? I say 'Yes'! And in this book I reveal how and why. Every single person on the planet sells every day whether you know it or not - the act of attracting a mate is the perfect example - and what you sell is, yourself! So you may as well know why and how you sell and you had better do it well. Thus armed you will improve your life and relationships, increase your financial wealth, raise your self-esteem and how others perceive you and you will be prepared to sell professionally at a high level where that is your aim. 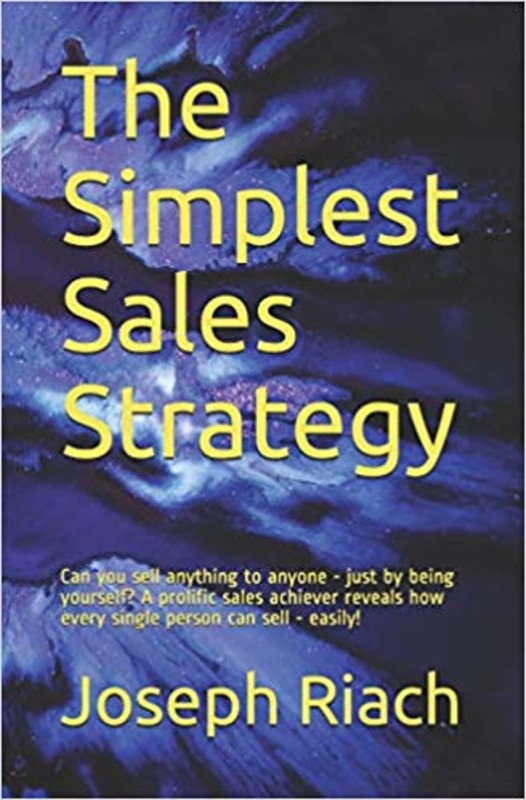 So whether just an ordinary guy intent on becoming a better communicator or one with aspirations to be a top sales professional then this book is for you. It provides an easy and quick way of ensuring that you are promoting yourself to the full and are on top of every situation ... professional or otherwise. Click to see Amazon page. "Do you dare to be different? Do you want to own your own future? If so, just waiting for things to happen will involve a long wait! You need to grab control of your own destiny and this book will help you to do just that. The title says it all! 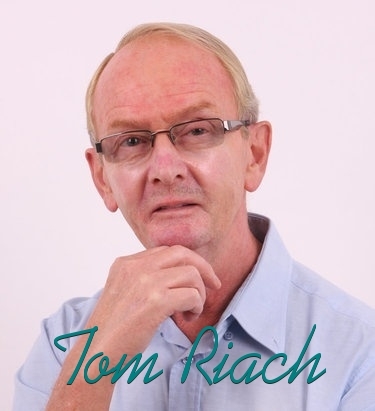 Tom Riach brings the full weight of his extraordinary entrepreneurial experience to bear with his remarkable revelations. In a series of easy lessons and fun stories he explains how determination and working smart are the keys to great achievement and shows how you can copy his success. Reading the first part will change the way you live your life; reading the second part will transform your view of working for yourself; and in the third part Tom reveals - for the first time - how to acquire substantial businesses totally free of cost and then run them without spending a dime! Stand by for a truly life-changing experience. As with all of Tom's works, this one is easy to read and laced with humour. From every angle, the read is an absolute gem." - literary review. Click to see Amazon page. 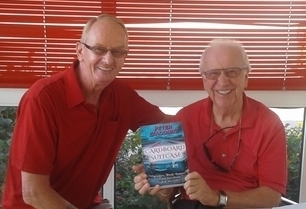 That's me (left in photo) presenting Peter Giacomini with the first proof copy of his autobiographical novel which I re-wrote, edited and published for him. The Cardboard Suitcase is biographical but it's also a romantic adventure presented with passion and humour. Peter's story spans six decades, four continents, a host of countries, people of all shades and dozens of the world's finest luxury hotels. It's an epic tale of a lad born into poverty in northern Italy but who cherished a dream to wait on the rich and famous in the splendour of grand hotel restaurants and whose eventual rise in the industry far exceeded even his wildest ambition. This roller coaster of a read will make you smile, wonder, grimace and applaud in turn; it gives an intimate insight into the 'behind-the-kitchen-hatch' workings of international five star hotels and their restaurants such as you never dreamed existed! Click to see Amazon page. Website by JTR : : : © Copyright Joseph T.Riach 2017-present : : : All rights reserved No. I am essentially introvert, so get much of my energy from being alone. I hate small talk and large groups. I'd rather listen and think than speak, and write rather than talk. I rarely answer the phone. Fortunately the online world suits me, I can attract an audience and connect with readers while still spending time alone ... and writing! As a young man it took me some years to establish myself in business but I believe that in life only the most resolute of triers will prevail and after several years of a bank account in a permanent state of cardiac arrest my perseverance began to pay! Today I host my 'Wake Up Leisure and Learning Breaks', personal mentoring and business guidance, in the calm and tranquility of the sunny south of Portugal and indulge my passion for writing. I am the author of several best selling books in the self-help, business and successful living genres. You can buy any of my books at the Amazon online store in either Paperback or Kindle format. They're also available at Barnes and Noble and other leading bookstores. Just click Visit Store or click the image below to visit my Amazon page. New titles will also be listed there as they become available. See below for Today's Best Deal. FREE SELF-IMPROVEMENT SHOULD BE FUN EBOOK! 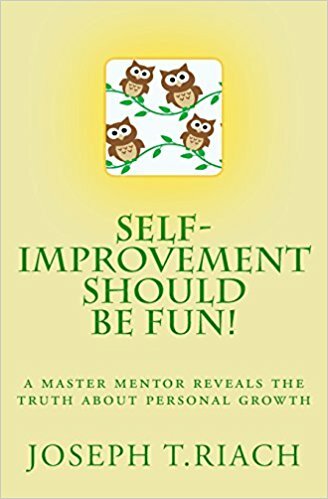 Buy Self-Improvement Should Be Fun in Paperback and receive a Kindle copy of the title totally FREE! And when you buy any of my other Paperback Books you can have a Kindle Edition of the same title for just $2.99! Simply go to AMAZON HERE and complete your purchase. But Hurry - offer ends soon! May 2019 - My latest book is published! It's a continuation of my present series giving new insights into how to conduct both your life and your business more profitably. 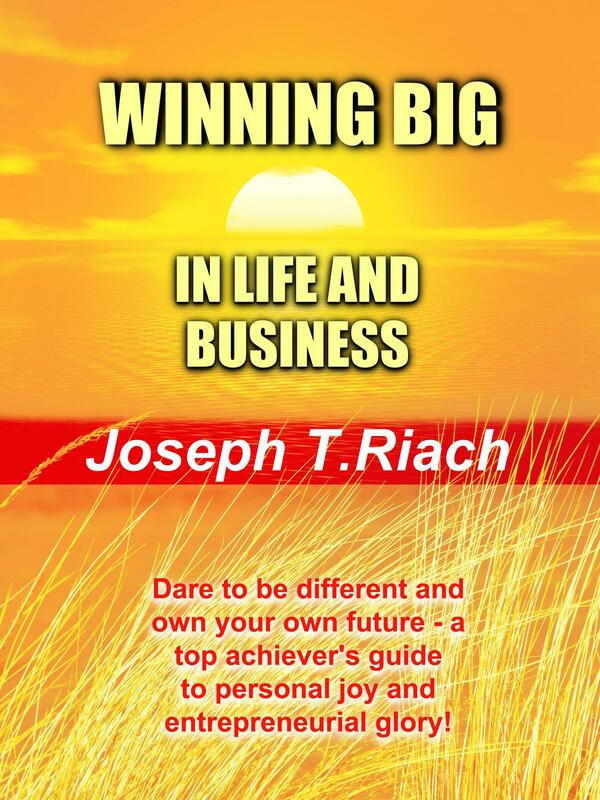 It's titled Winning Big In Life And Business and is available NOW in both Paperback and Kindle versions. After taking a couple of weeks to chill out, I'll be continuing with my next writing project. It's a 'motivational mystery novel', already well advanced. It should be ready for publication early next year. I'm particularly excited about this work! More details of that here soon. My other recent writing project, the rewriting and editing of a biographical romantic adventure for an Italian client is already selling well and attracting much interest. It's a compelling, often hilarious read. You can learn more about it at The Cardboard Suitcase and purchase it there. You can find more news about me, what I'm up to and my work at Tom's Blog Page.